"Aid and Comfort": Jane Fonda in North Vietnam evaluates her wartime journey to the Communist regime by measuring it against the American law of treason. It is the only book proving that she could have been indicted for and convicted of treason. Beginning on June 1, 2018, "Aid and Comfort:" Jane Fonda in North Vietnam will be serialized every two weeks on this site free of charge. Other than for required formatting changes required by posting formerly printed text on the Internet, the serialized edition will be identical to the published hard- and soft-cover editions. We former POWs will never forget being forced to listen to the propaganda broadcasts of Jane Fonda from Hanoi. "Aid and Comfort": Jane Fonda in North Vietnam is 'must reading' for those who want irrefutable proof of Hanoi Jane's treachery, and its legal significance. “Aid and Comfort": Jane Fonda in North Vietnam is not a potboiler; it is a blood boiler, and your blood will surely boil when you read the Holzer's description of Jane Fonda's treachery during the Vietnam War. As a combat infantry officer in Vietnam, I can attest to the fact that Jane Fonda, and people like her, succeeded very well in lowering troop morale, and as any combat vet will tell you, low morale leads to lowered effectiveness, and that leads to battlefield deaths. This book will shock many Americans. That Fonda committed many acts of aid and comfort documented here is astonishing. That the American government looked the other way is astounding. This book provides the indictment that the government could have handed to a jury--if it had the will to do so in those days. A 'must read'! For three decades Jane Fonda obfuscated, distorted and lied about virtually everything connected with her wartime trip to North Vietnam: her motive, her acts, her intent, and her contribution to the Communists’ war effort. With the aid of clever handlers, she so successfully suppressed and spun her conduct in Hanoi that many Americans didn’t know what she had done there, and, more important, the legal significance. 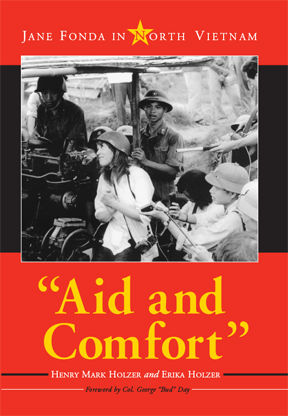 This serialized Internet edition of “Aid and Comfort”: Jane Fonda in North Vietnam has been made possible by the generosity of the original publisher, McFarland & Company, whose rights are reserved and whose graciousness is gratefully acknowledged. The authors are indebted also to Col. Joe Kittinger, USAF, Ret., who was instrumental in making this edition available to a wide audience, and to DL who wishes to remain anonymous. Copyright © 2019 by Henry Mark Holzer and Erika Holzer. All rights reserved.